Hey, got a quick question about backup copy job. Does backup copy interval has any influence for GFS retention? Copy interval is every 14 days for example. Does copy interval affect only restore points to keep or also GFS? I mean if I have 14 days copy interval, means I would have problems with my weekly backups, or no? Hello Vyt and welcome to the community! In this case the job should run weekly in accordance with the GFS retention option. Got another question about "Restore points to keep". If I set "Restore points to keep: 2" and if I understand it correctly according to this topic: https://helpcenter.veeam.com/docs/backu ... tml?ver=95 after I have 2 restore points, on 3rd day Veeam should "merge" 1st and 2nd restore Point, so that I would keep 2 restore points, but in my case I have a lot more and they not really merging. Your understanding is correct, but if you set "Read the entire restore point from source backup instead of synthesizing it from increments" option there will be no merge, what results in 7 restore points in the chain. Vyt wrote: Does copy interval affect only restore points to keep or also GFS? I mean if I have 14 days copy interval, means I would have problems with my weekly backups, or no? I'm a bit confused, since with the copy interval set to 14 days, you cannot have weekly GFS fulls, they will be bi-weekly. foggy wrote: I'm a bit confused, since with the copy interval set to 14 days, you cannot have weekly GFS fulls, they will be bi-weekly. Well yes, now I know, but that was my original question because I wasn't sure of relationship between copy interval and GFS. For some time I thought copy intervals are just for "Restore points to keep". The whole setting up of backup job is a little bit confusing. You have three different settings of "time" in different areas. First copy interval, then under "Target" you got "Schedule" and then also separate tab for "Schedule". Copy interval and "Target" settings somehow should work together. If I choose that I want weekly GFS backups, it should tell me that I cannot have copy interval of more than 7 days and/or other way around. I agree, that backup copy job setup might look confusing, we're working on improving it though. One more question about backup copy. 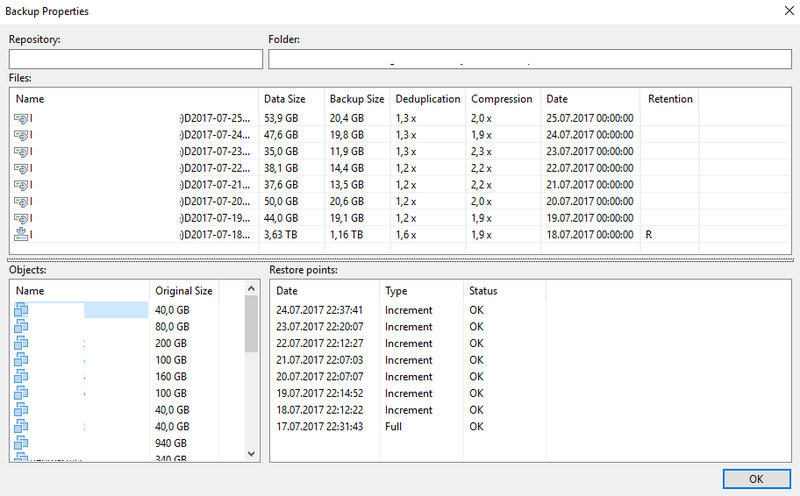 I want to copy backups once per month, on last Sunday of the month, and keep 2 months of backups. I enabled job on 17th of the month. Right after enabling, it made a first copy. Now it most likely got like 20 days more to wait till it will copy again. What will happen on this sunday, since it is the last Sunday of the month? My guess would be - nothing and my backup copy job won't work as I intended. Any tips? Any help on how to set up 2 months backup copy job on last sundays of the month? If you want them to be put aside exactly on last Sunday of the month, you need the job to run daily (1 day copy interval). Otherwise it will wait for the next job run and mark the current full as a monthly one.